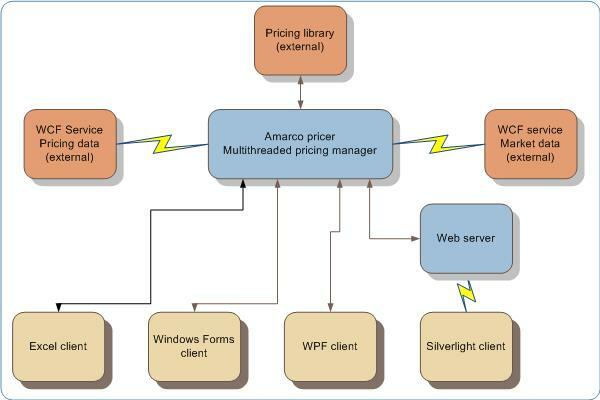 Using the Amarco architecture concepts and leveraging our trading room activity (design & implement indices and equities derivatives pricers), we designed and developed a working high end multithreaded trader pricing framework, optimized for derivatives pricing instruments (indices and / or equities). It can use as user interface any Microsoft facility: WPF, Silverlight, Windows forms or Excel. Real time feed for market bid/ask prices, using an asynchronous WCF Web service to get market prices (simulation). Asynchronous results display. Various animated demos are available, please use the left navigation pane. Microsoft technology used: Multithreaded Excel 2007, Multithreaded Windows forms, Dotnet C# 3.5, Visual Studio 2008-2010, WCF service extensions, WCF services (client, server), VSTO 3.0, Silverlight, WPF.